Plastic Hat Shapers are the most affordable plastic hat blocks available today. They come in around 40 classic designs and with a little adaptation they can be used to create something even more spectacular. 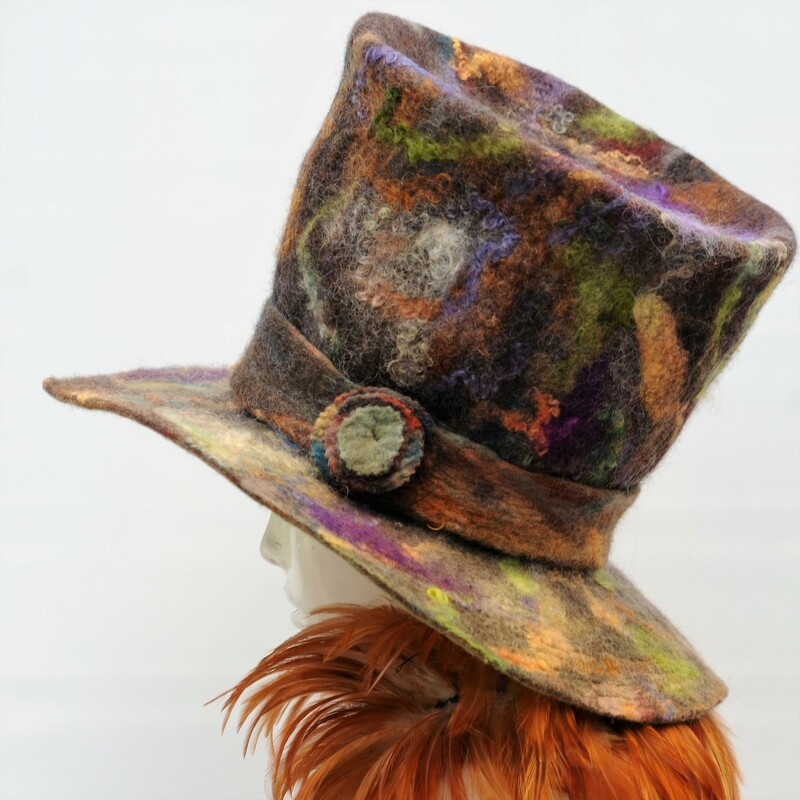 This giant sized top hat really does pack a punch and the wearer would find not find themselves out of place if they wore it to a music festival or a Mad Hatter's tea party. 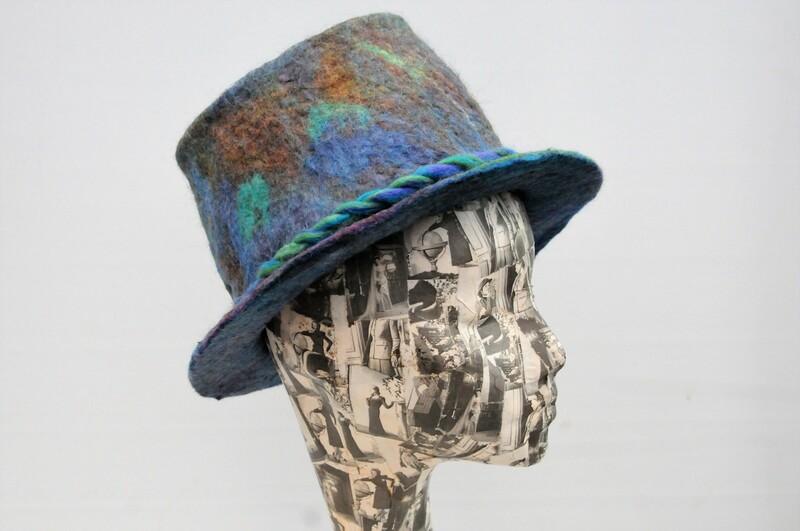 The hat was made entirely from merino waste yarn which was purchased from Amazon. 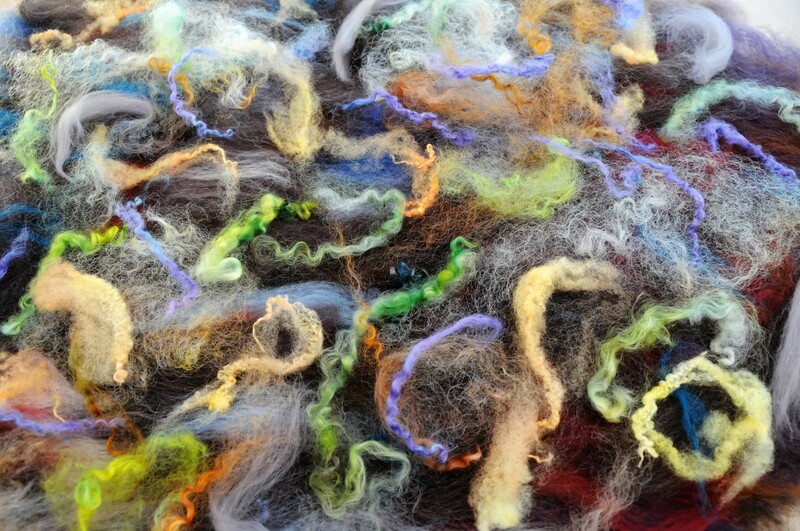 This is such an exciting way to buy wool roving. No two batches are ever the same. 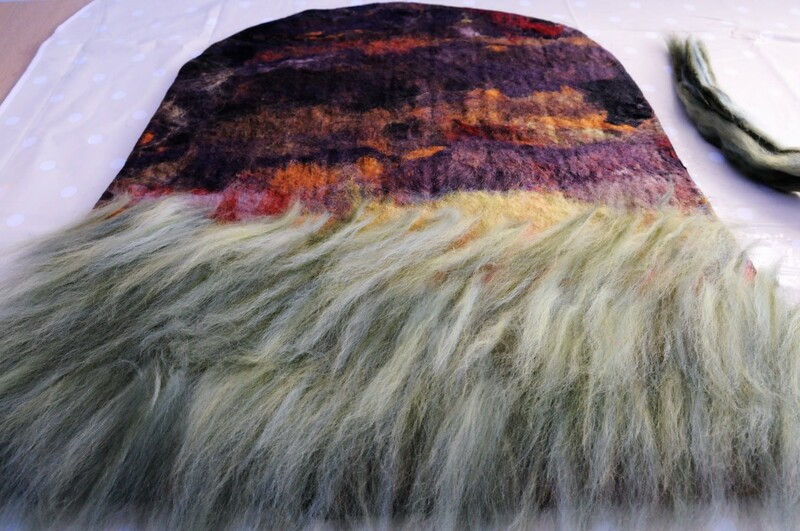 It gives one the perfect opportunity to go wild with color and texture. 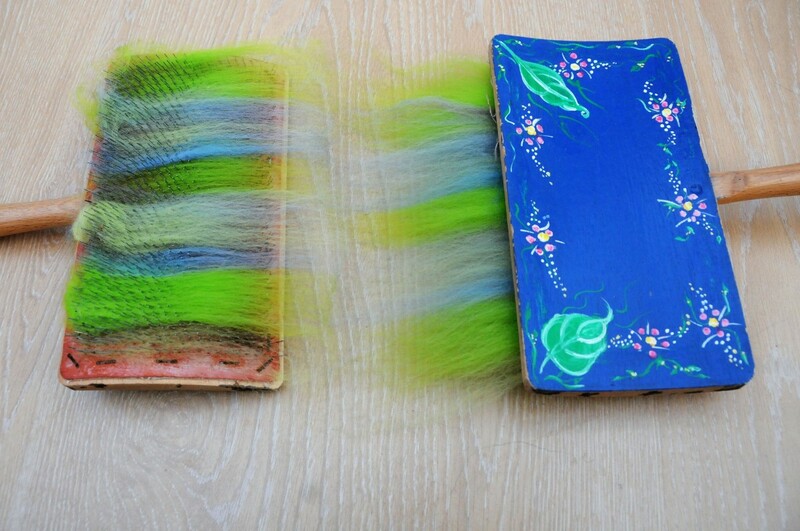 Hand carders were used to blend the waste roving together to form a thick batt. 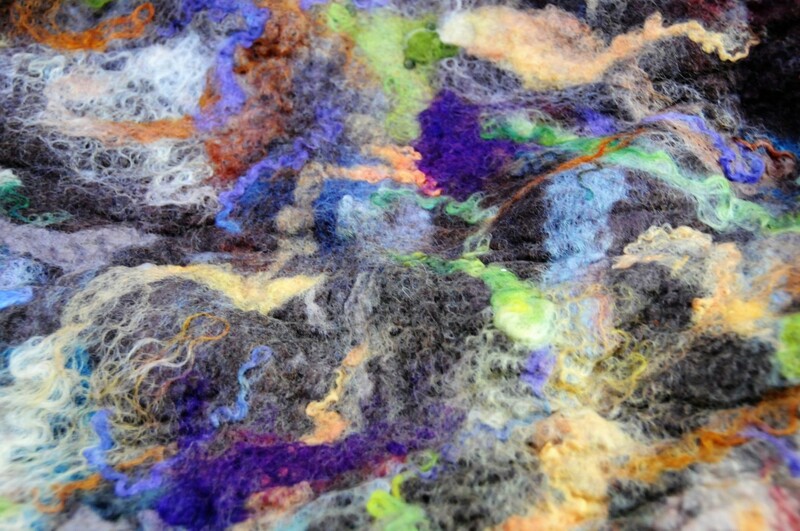 The surface was embellished with oddments of dyed wool curls. 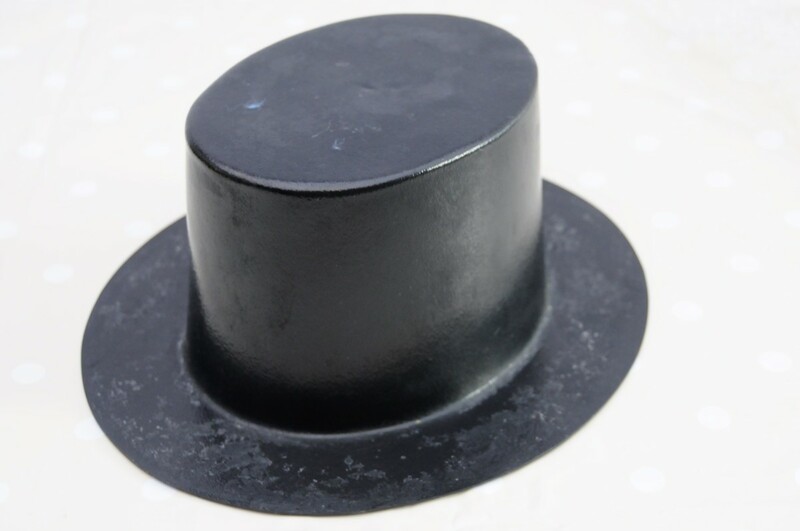 It is these which give the Top hat its rich color and texture. Learning how to use Wool Carders can take a while to get used to. Patience and practice are required! 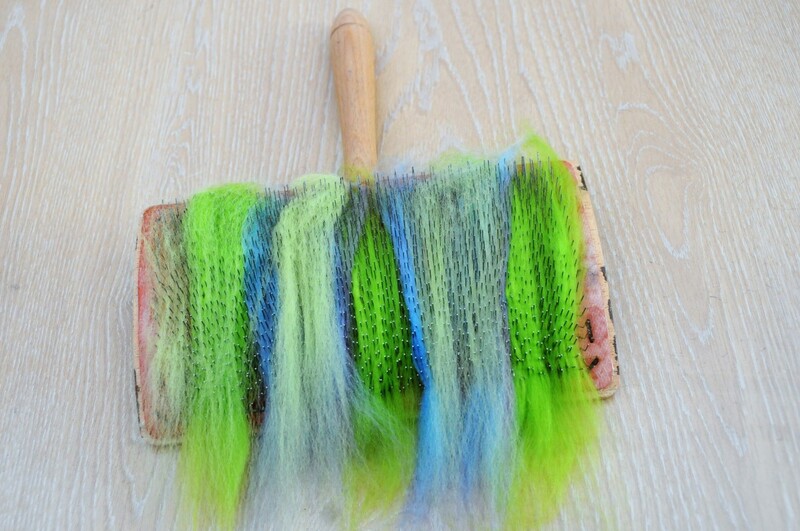 A soft and delicate touch is needed to achieve the best results but hand carders are essential tools to have if you want to learn how to blend your own colours for spinning, weaving or wet felting. 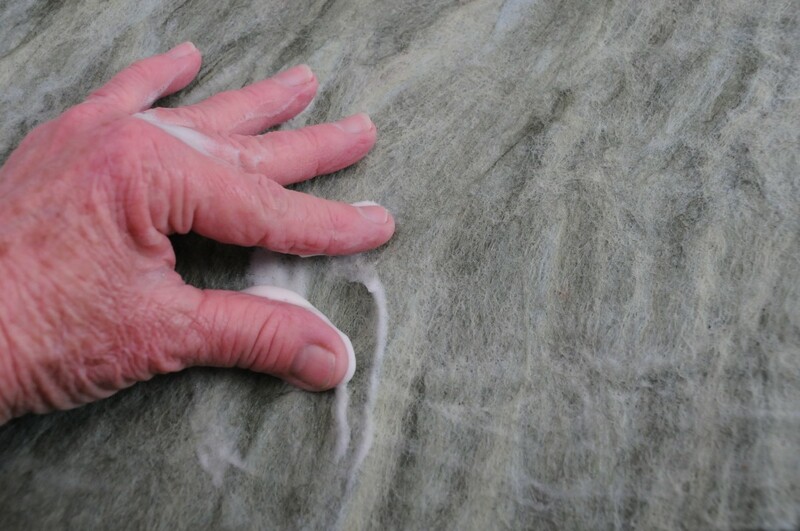 A further layer of wool fibres were applied as a final layer to increase the thickness of the wool but this step may be deemed unnecessary if the wool batt or carded wool was made is made having good depth. 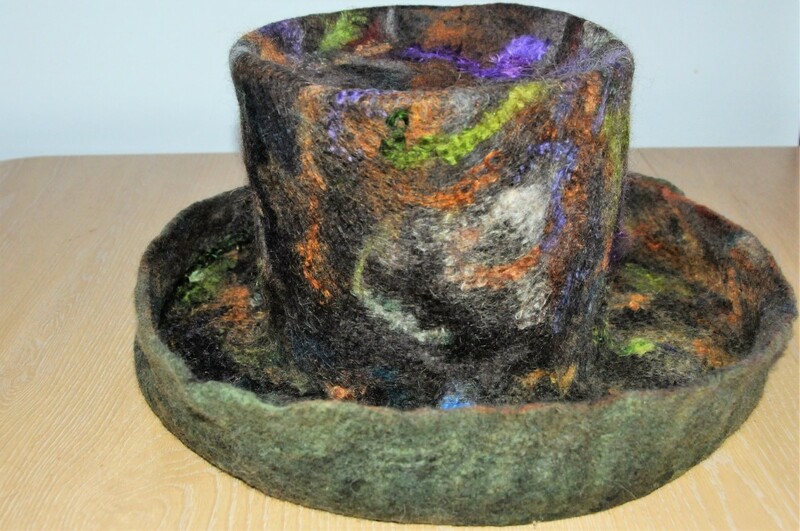 A hat template made from bubble wrap or floor underlay. Please see image below. 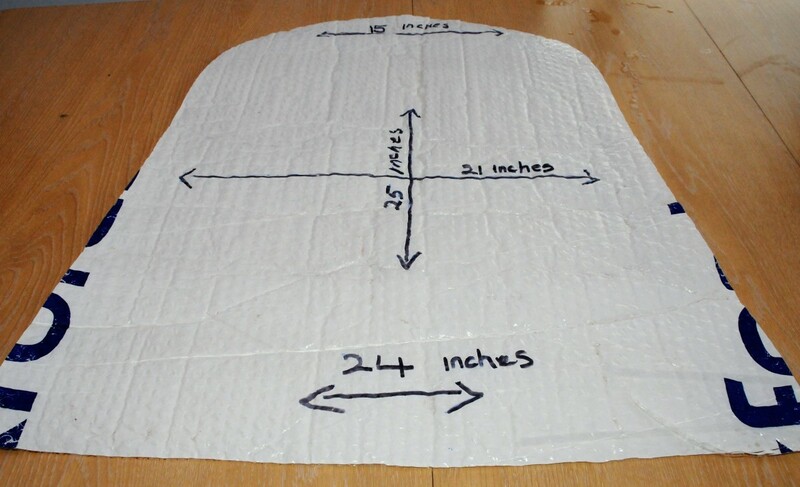 Step 1—Buy the Size Right Size Hat Shaper! A large Hat Shaper was used for this project. Choose one to fit the head size of the person who will be wearing the hat. 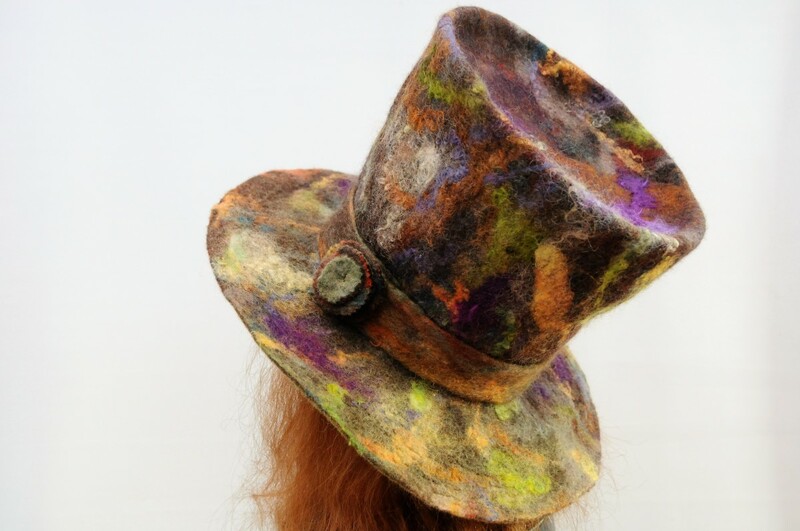 The hat will be shrunk down to the size of the Hat Shaper which is being used for the project. 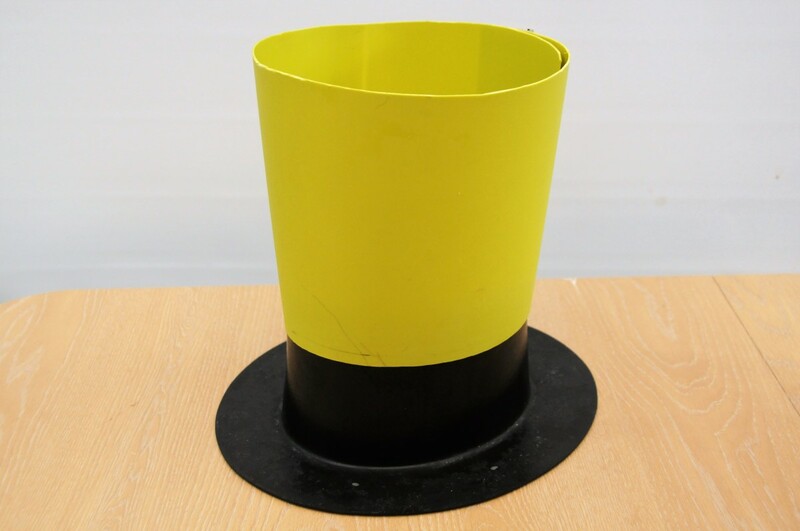 Add a plastic collar which can be cut from a plastic waste paper basket. This will make it easy to increase the height of the hat and width of the top section of the hat. 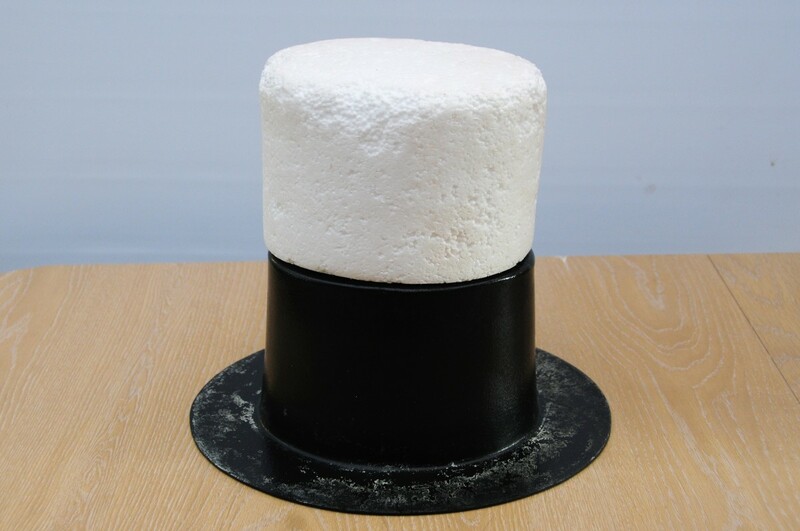 The polystyrene hat block which comes in useful when you want to retain the correct height of the hat when the sides are being shrunk down. The initial shaping which takes place with the collar on will be unaffected by the removal of the collar when the correct shape has been achieved. The Polystyrene hat block is easily removed because it is the same size as the hat shaper. Keep the right side face down on the template. This tutorial assumes that the reader understands the basics of putting down fibers onto a template. One thick layer and one thin layer were used here to get the right thickness. Add texture in the form of curls. Wet the layers with hot soapy water. 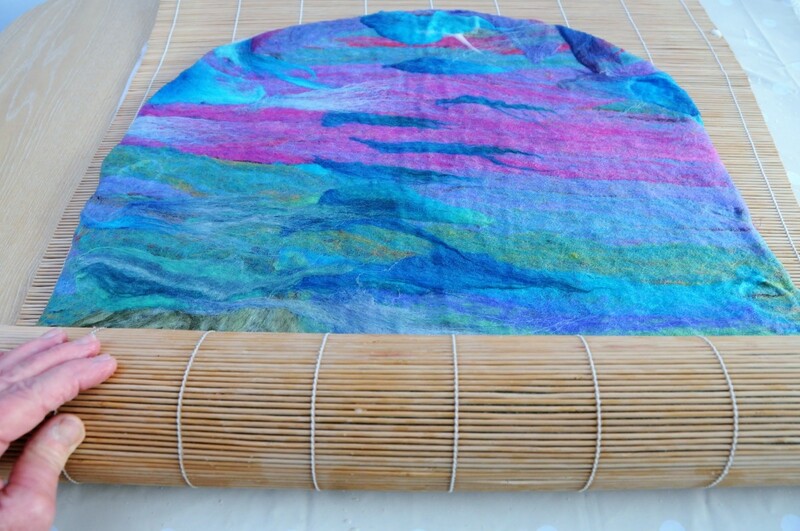 Rub and roll inside a bamboo mat. 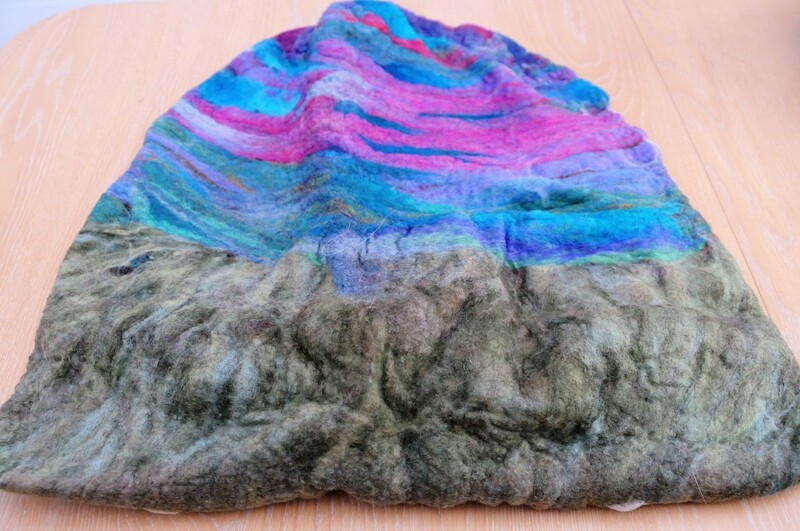 Finally, the project is partially felted in a tumble dryer so that partial shrinkage can take place before shaping the hat on the hat shapers. Tape the collar with plastic tape and place a large saucer inside the space made by the collar. 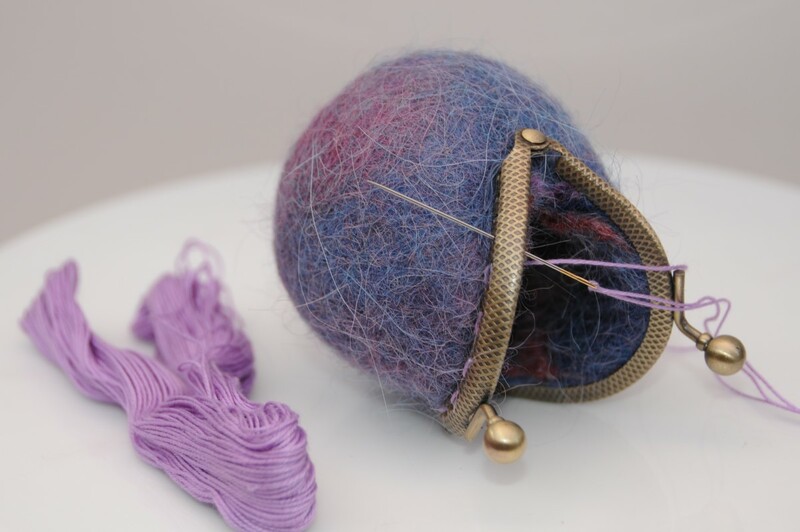 This saucer will keep the collar rigid and in place while you are shrinking down the fibers. 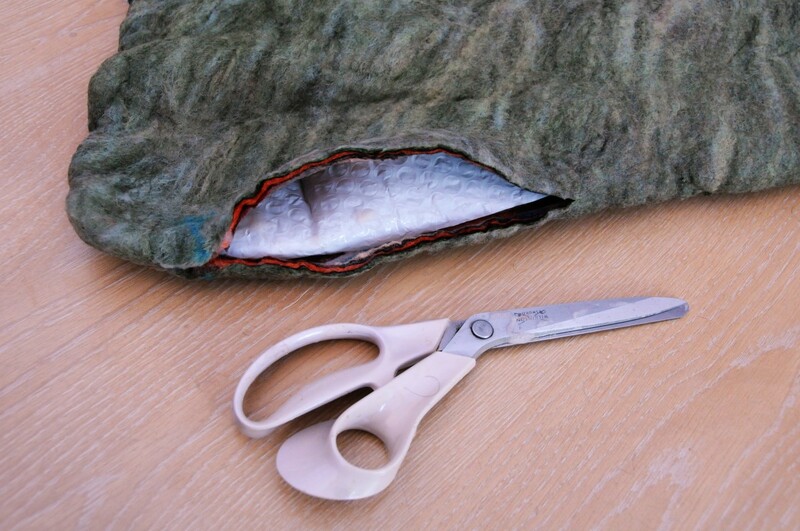 Fold the excess felt around the shaper to keep it out of the way. Add dishwashing liquid to a folded piece of bubble wrap and begin rubbing the top surface of the hat. As the fibers start to shrink work on creating a fold around the top edge of the hat using the plastic collar edge as your guide. Shrink the sides of the project around the collar using the folded bubble wrap. Once the hat has taken on the cone shape of the collar remove it and put in its place the polystyrene hat block. 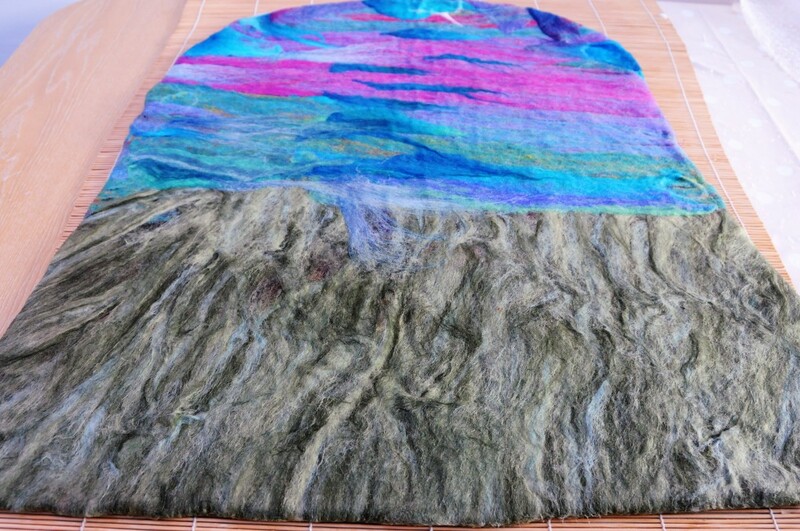 Continue shrinking the fibers until the desired shape is achieved. Rub the brim until it feels very firm. Rinse under the tap using hot and then cold water. 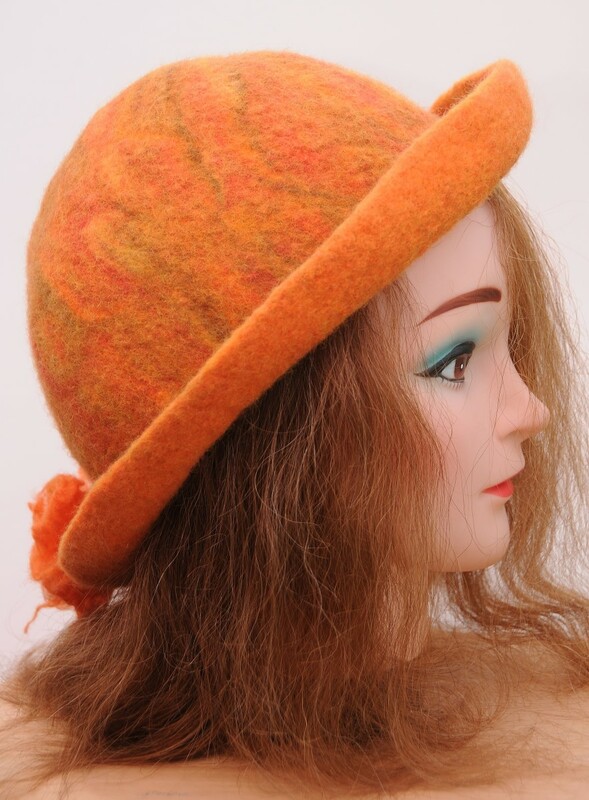 Continue working on the hat until you are happy with the shape and the firmness of the felt. Rinse the hat using a warm vinegar rinse. 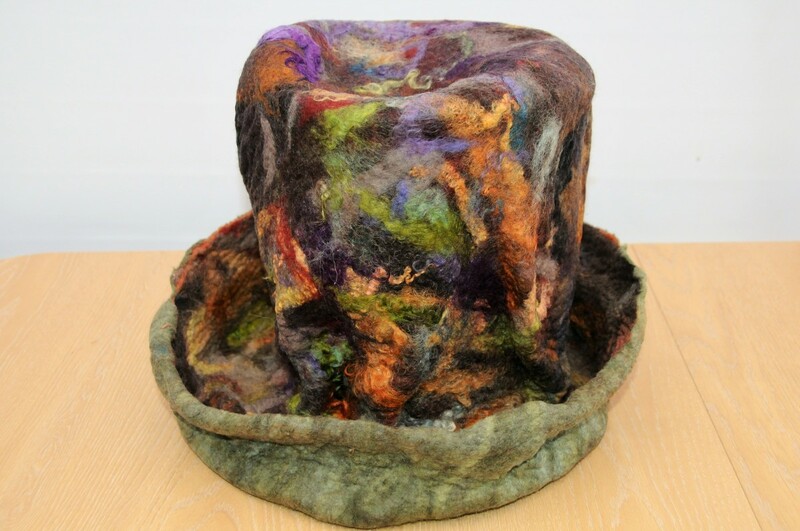 If the top of the hat requires further folding and adjusting of its shape, remove the polystyrene hat block and leave the top section hollow and make any adjustments. 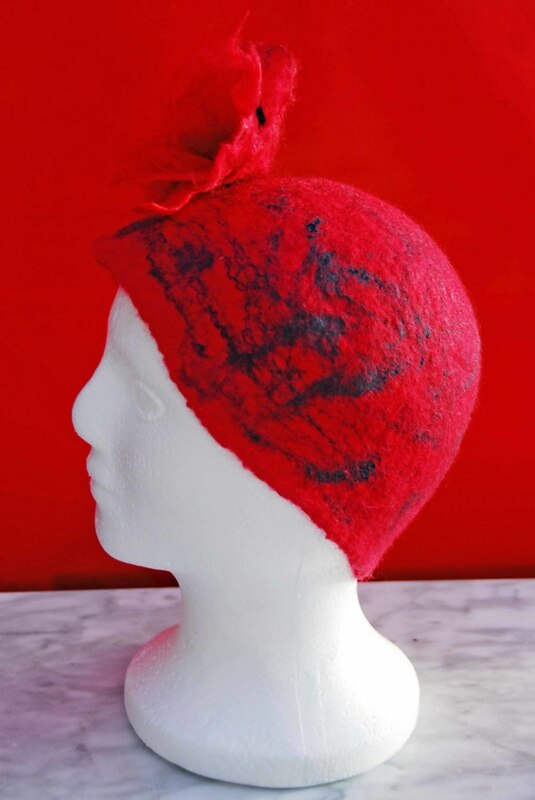 Any excess felt should be now be cut off and retained for use as a hat band. 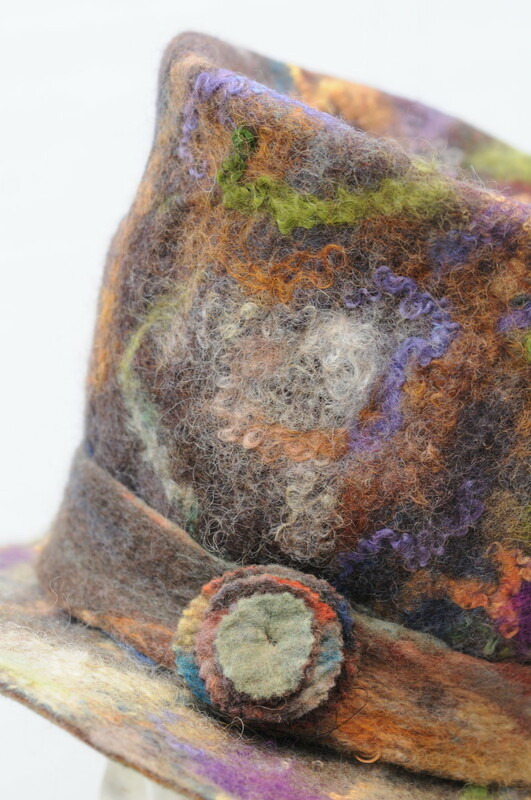 Any leftover pieces can be used to either cover a very large button or cut 3 circles to make a decorative piece with which to conceal the join in the hat band. Towel dry the hat and then leave it in a warm place to dry. A cake rack can be used so that air can circulate freely around the hat. Finally, make the decorative pin and sew the hat band on. 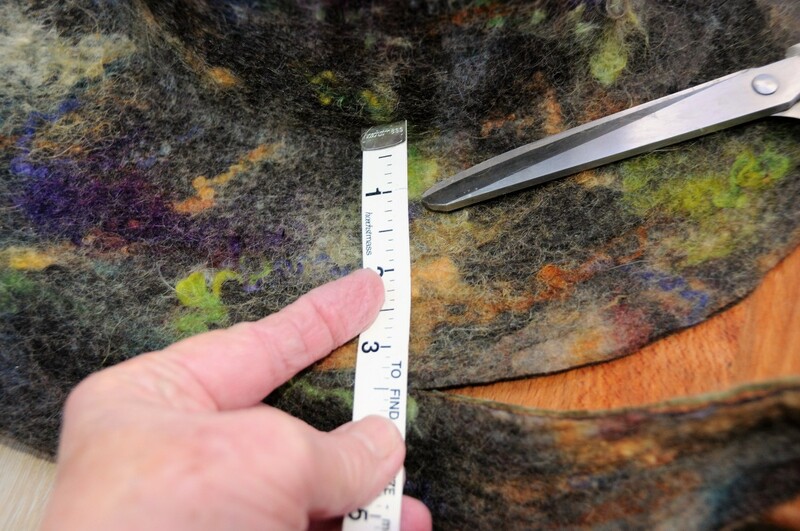 How likely are you to use Hat Shapers for hat making? I am only interested in seeing how the process works. Where can I buy a hat shaper like yours in the UK please? 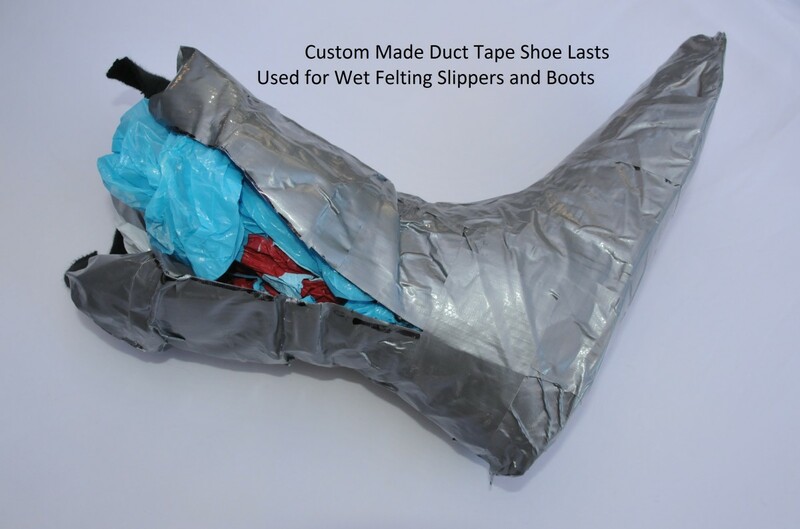 You can try e-Bay or Amazon. 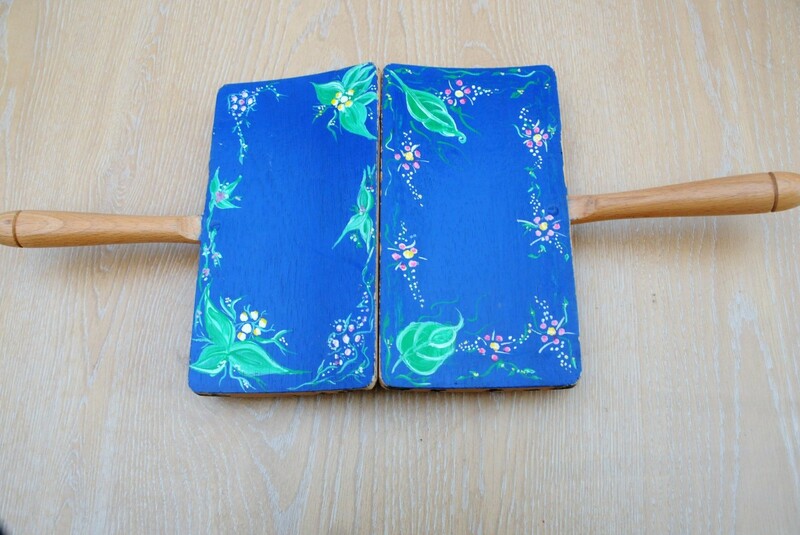 I currently have 2 of my own hat shapers from e-bay, but not a Top Hat. Thank you for taking the time to stop by to comment on this project Mary. It is much appreciated. Even if I will not be using this, I enjoyed reading about it. You are so creative and resourceful. You made a fantastic looking Mad Hatters hat! Wow! What a process to get to the finished product. You are an amazing talent. Thank you so much for the share and the comment. 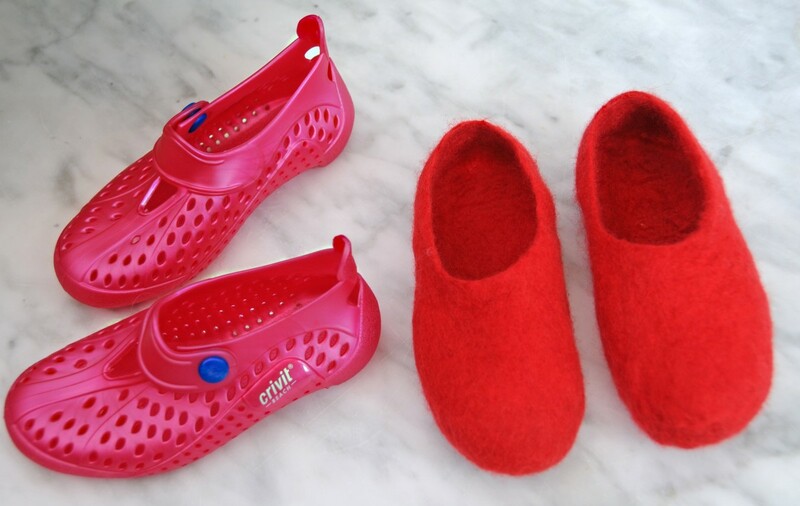 I do know from old that South Africans love to do crafts so that means a lot to me. 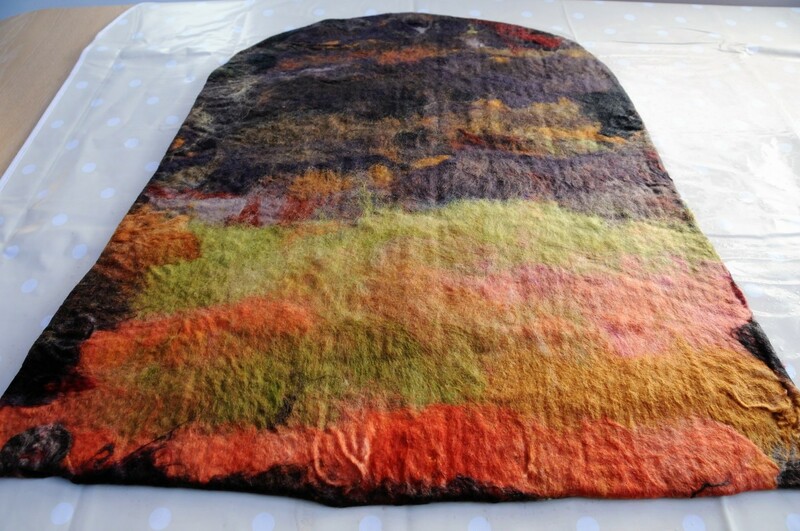 Wow, Sally, you have become a master in felting. I just love all your creations. I am sharing this all over the show. I am glad you find my techniques helpful. Your techniques are very helpful for people who want to learn this craft. 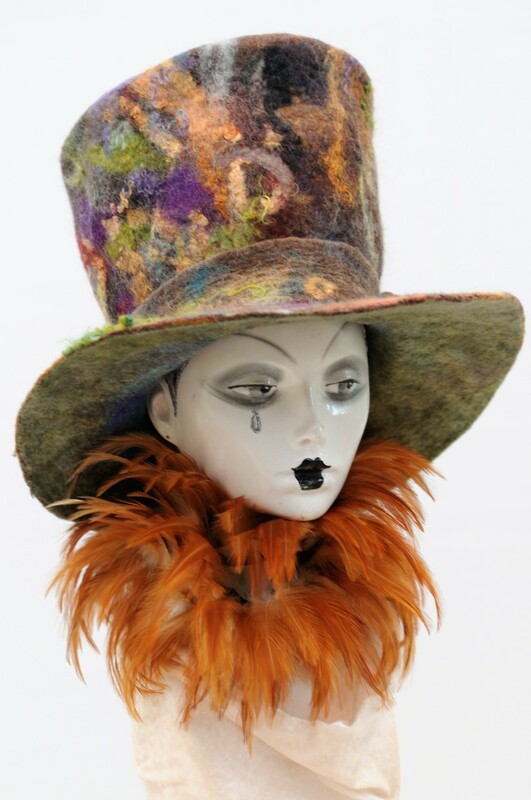 What caught my eye is how much the doll in the hat in the first picture looks like Boy George circa 1983. I could literally hear the doll singing "Do You Really Want To Hurt Me". I was big boy George fan, by the way. Thank you Devika, you are too kind! I hope you are well and looking forward to the festive season. I Tweeted and like your creative ideas! You are right, it is an amazing creative process. 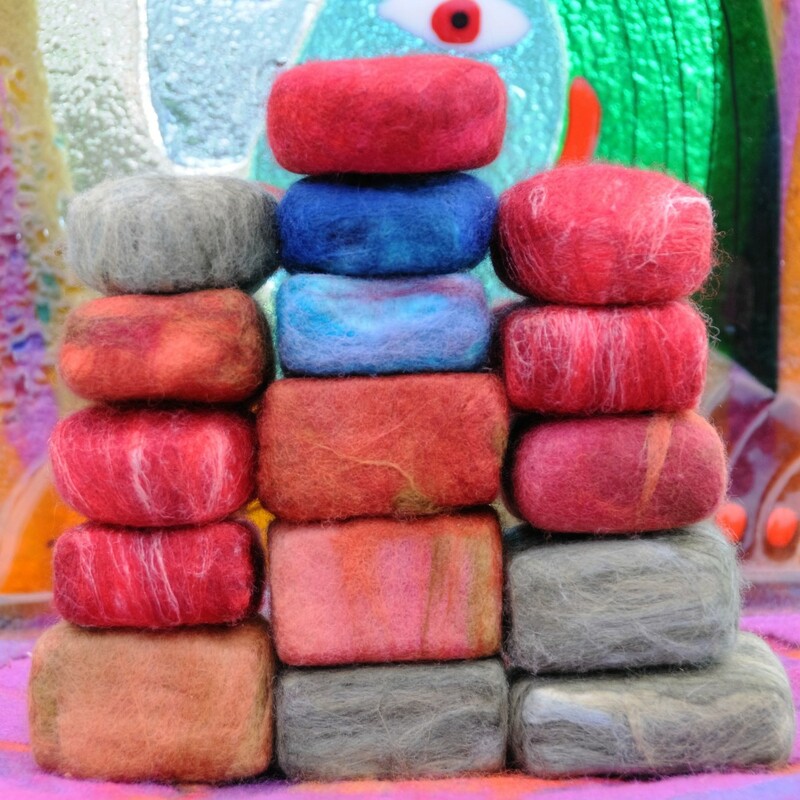 I still find it fascinating to think that one can make felt from just a few fibres and turn them into 3d items, many of which are wearable. Thank you for taking the time to stop by and to comment. That is so very clever! 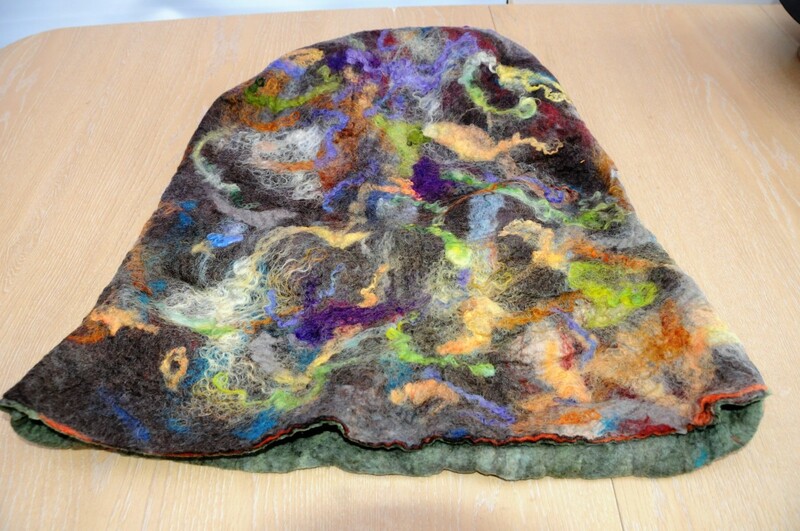 I love felting and felted items. I believe it is such a wonderful craft. 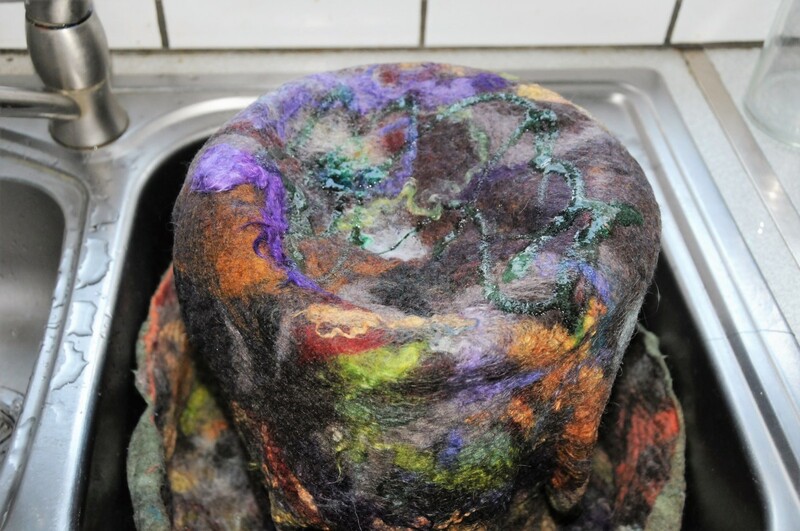 It has taken a while to get this far MsDora and I have not had much time to think about a lesson by lesson curriculum though I do have plans going forward, perhaps a felting book or two! Thanks for stopping by to comment MsDora, you are valued and appreciated. Sally, have you started compiling your lesson by lesson curriculum? 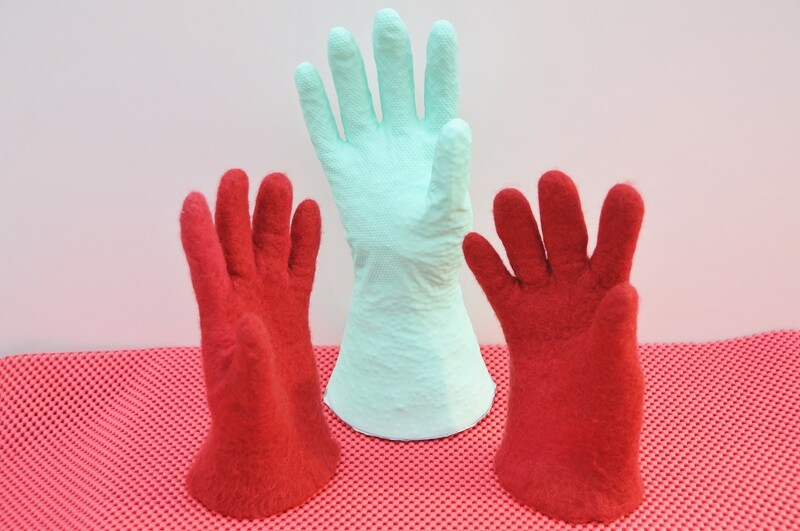 You're on a roll with these wet felt projects. This hat rocks! So nice to know that you liked this project, thank you for taking the time to comment. Hi Donna, glad you liked it. 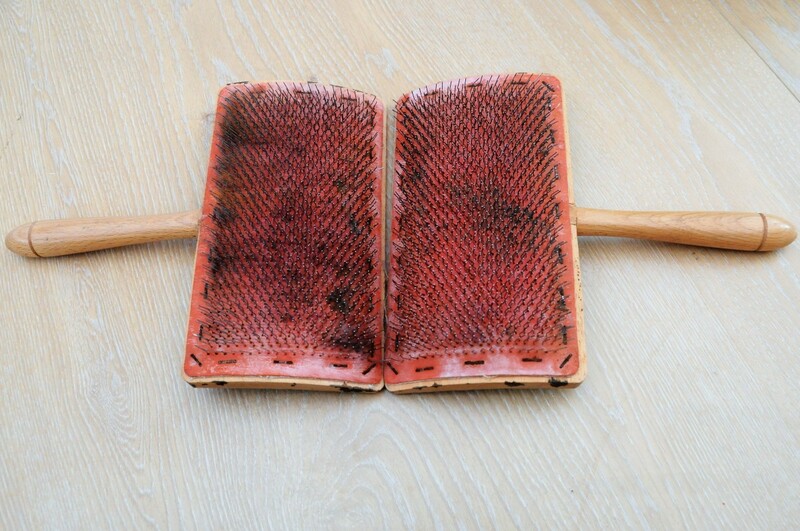 Hat shapers are definitely more affordable than wooden hat blocks, not as tactile perhaps but they are extremely functional. Interesting technique and a great tutorial! 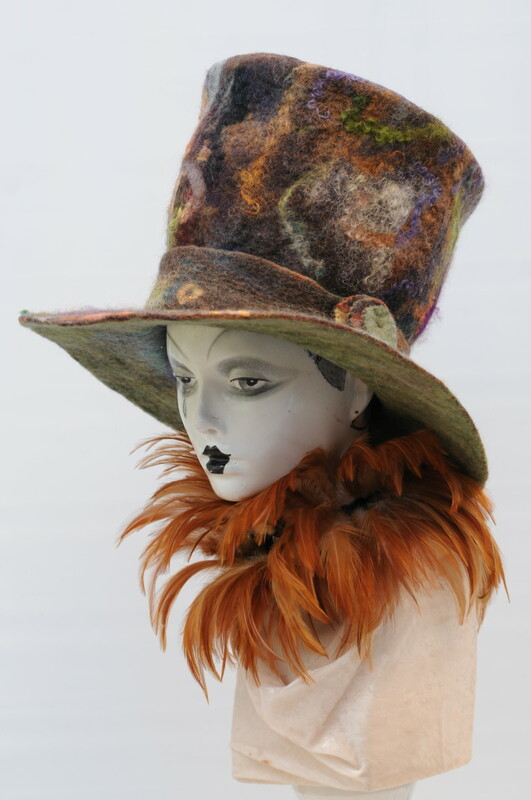 I can see how using a hat shaper would help create a lot of different looks and styles. Thanks for sharing this great project! Thanks, Billy I am glad you like it. It certainly packs a punch and I am sure that there is someone out there who would love it. I will probably try to sell it on my shop page. I saw this on Facebook and thought it was adorable. I could sell quite a few of them to former students of mine. :) Well done, Sally!